If your home is a victim of water damage, whether it’s from a broken pipe, a flooded bathroom, or a malfunctioning appliance, or if it’s from a natural source such as melting snow or excessive rain, you’ll need to take the necessary steps to ensure the life of your flooring. Carpet can be especially needy when it comes to water damage, since it’s not as easy as wiping up a spill. Plus, mold and mildew can begin to grow in as little as 12 hours depending on the nature of the damage! If your carpet has recently experienced water damage, take these steps in order to save both the carpet and your wallet! 1. Dry Wet Carpet FAST! If your carpet suffers water damage, one of the best things you can do to help prevent mold or mildew from growing is to do your best to dry the wet carpet quickly. Towels are great to soak up a spilled drink, but depending on the nature of the damage, you may want to open a window, turn on a fan, or grab your blow dryer! Dehumidifiers can also help. Of course, if there’s a larger amount of water damage (for example, from a leaking appliance or a small flood), you may want to rent a wet-dry vacuum if you don’t already have one. Calling the professionals in never hurts either, especially if there’s significant water damage that you’re unable to dry up quickly and effectively. 2. Don’t Forget the Padding! Depending on the nature of the water damage, it may be necessary to pull up your carpet to expose the padding underneath to dry it out as well using the drying methods mentioned above. If you need to do this, but aren’t sure how to peel back your carpet, this short instructional video will show you how. 3. Deodorize! Unattended, water-damaged materials will begin to develop a musty smell rather quickly. Dry out your carpet as best as you can using a fan or wet-dry vacuum, and when it’s still slightly damp, use a live-enzyme cleaner, which can be found online (like this one) or at any local retail store. If you purchase a cleaner, follow the directions on the package. However, you can also make your own cleaner by mixing equal parts hydrogen peroxide (3% hydrogen peroxide is preferable here) and water. Dab the area of the carpet you wish to deodorize using a sponge. This also helps draw out any mold or mildew. After 30 minutes, repeat this step. Sprinkle baking soda on the area, let it sit for a few minutes, and then vacuum it up. If there’s still an odor, you can blot the area using white vinegar, which absorbs odors. 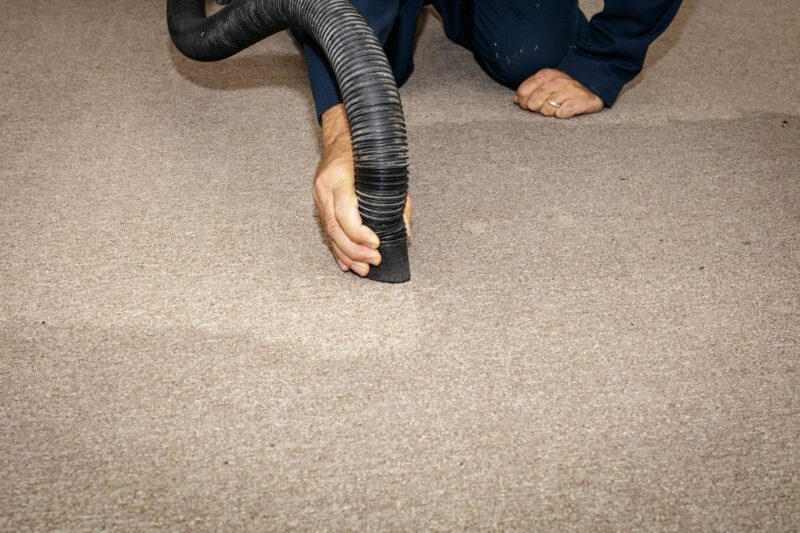 We hope you found these tips helpful in repairing your water-damaged carpet. If you have any questions, or feel further assistance may be necessary, please don’t hesitate to call your local Elite Restoration office. We’re happy to help!